Lambeth Council creates its own brand of local workfare: Get set go! ‘gaining horticultural/maintenance, creative and project management experience’. They leave out getting the odd cup of tea, maybe they just couldn’t agree on any specifically ridiculous wording for potential quasi-skill set, for example: to professional tea taster or to the development of professional tea buyer which would include exciting travel opportunities to pick the best leaves for brand name teas, gaining exceptional skills in quality control and financial exploitation for a multinational corporate body. So if it’s possible to give monthly rent adjustments to cover shortfalls: why can’t they just do that for everyone? 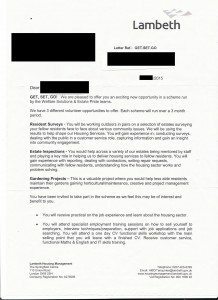 Why do people need to work for 3 months on Lambeth’s bizarre version of local workfare? And of equal importance -are Lambeth in breach of the Equality Act? Even if a disabled person wanted to take part in this sham none of the options seem particularly accessible. Lambeth announced in 2014 that they would tackle the issue of bedroom tax with what they called a ‘work first’ approach. The DWP’s own 2015 report said that three quarters of those effected by the bedroom tax were going without food and/or heat while just 1 in 9 of those affected had been able to move home to a smaller property. We know it’s much more difficult for disabled people to move home due to completed adaptations to their homes and local family and friends networks. Surely, the only correct thing to do is to scrap this punitive tax that persecutes those with the least- Lambeth council show they can do it for 3 months-or to work at local levels to alleviate the inhuman impacts of bedroom tax on local individuals, families and children? No, Lambeth chose to devise ‘work first’ workfare schemes to add further persecution and provide them with labour at the equivalent of a x pounds a week , reducing their own employment costs, driving down wages, and denying real paid jobs in the process. If anyone thinks that this is a useful initiative, think again: how long before this turns to 30 or 40 hours per week, how long before dwindling ‘services’ need to be exchanged for work in a ‘work first’ local agenda? What happens to those who can’t work because of chronic ill health, or impairment, and those that need additional support? Very illuminating document that Welfare Reform Report. Took time to read it today and answers quite a lot. Living in Lambeth and being subject to the Spare Room Penalty I have asked Lambeth time and time again why they continue to be punitive rather than choosing to get creative about how they face the tax. O live in a 2 bed adapted property and feel like they are trying to harass me into leaving my home not helping me to stay. Even if I wanted to move which I don’t why would I lose my assured tenancy for a five year tenancy? That is provided that that had a one bed adapted property that was suitable for my needs, which there isn’t, I can’t take ‘advantage’ of this exciting opportunity to learn to sell myself being in the Support group for ESA, again if I wanted to, which I don’t but as it goes can’t. Likewise I’m sick of being ‘selected’ to attend a housing swap exhibition! So yeah that document really does explain a lot and confirms that I am being harassed into leaving my home and yet again placing the ‘blame’ onto those who ‘refuse to engage’ i.e. acquiesce quietly to giving up their home. Yet again Lambeth using the same language as the conservatives which further confirms their narrative that those on benefits and living in social housing are feckless wasters refusing to shift. Great piece good to see that Local Authority Workfare schemes are being exposed.